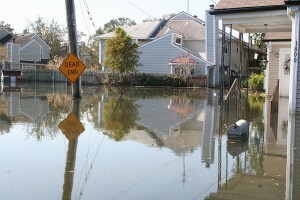 You are here: Home » About » What Makes Hurricanes So Dangerous & Devastating? Florida lawyers fighting insurance companies over your hurricane claim. What makes hurricanes so devastating and dangerous? Most people’s immediate answer is the strength of the winds. While this may be the main reason for many deaths and much of the destruction, the days just before and after a Florida hurricane can be almost just as deadly. Firstly let’s look at the different categories of Florida hurricanes and exactly what level of direct damage you can expect from them. According to Weather.com, the website of The Weather Channel, a tropical storm becomes classified as a hurricane when it’s winds hit or exceed 74 mph. Hurricanes with winds of 74 to 95 mph are considered category 1 hurricanes. There are five categories of hurricanes, 1 through 5 with 1 being the least powerful. However a category one storm can still easily cause flooding and wind damage to trees, mobile homes and signs. A category 2 Florida hurricane brings winds between 96 and 110 mph. This brings damage to roofs, windows, doors, blows down trees, floods marinas and can cut off low laying escape routes even 2 to 4 hours before landfall. Considered to cause extensive damage with winds between 111 and 130 mph, category 3 hurricanes can destroy mobile homes, cause structural damage to small buildings even inland, flood terrain less than 5 feet under sea level 8 miles or more inland and can cut off escape routes 3 to 5 hours before landfall. A category 4 hurricane calls for massive evacuation up to 6 miles inland. 131 to 155 mph winds cause extreme destruction, major flooding can be expected, structural damage to buildings can be expected with those closer to the coast at risk of complete destruction. According to the National Hurricane Center the most dangerous level, category 5 hurricanes cause catastrophic damage, cause complete failure of roofs of both industrial and residential properties as well as complete demolition of structures and major flooding. Massive evacuations are required. Hurricanes are known for their eye shape. One of the biggest dangers for Florida visitors and residents is miscalculating when a hurricane has passed. The initial stormy weather comes from the outer bands of a hurricane. The eye of the hurricane is actually a hole in the storm. Many confuse this with the storm being over when the worst of the hurricane can still be to follow. This has caught many Florida residents off guard causing fatalities. When you look at the actual numbers and causes of the deaths from hurricanes they are broken into being classified as either direct or indirectly related to the impact of the hurricane. When analysing the statistics you will find that only approximately 60 to 80% of the deaths are determined to be a direct result of the hurricane hitting according to the CDC. The other portion of deaths related to hurricanes that are considered indirect are comprised of violent crimes, carbon monoxide poisoning from generators and incidents like electrocution from downed wires as well as accidents when protecting homes.